Please login to your account to access this page. You need to login to your account to access this page. If you do not have an account, you may join now. In order to advertise a job, please send us an enquiry. Each year, an ASBCI sponsor funds prizes for the best dissertation on a topic related to the fashion and textiles industry. At the end of the academic year, after dissertations have been assessed, member colleges and universities are asked to submit its best work to be put before an academic and industry reading panel. Some of the larger institutions may submit entries from different courses if the situation merits it. The reading committee assess the nominated entries against the criteria of topic relevance and value, depth and breadth of research, clarity of analysis, and quality of presentation. Final debate and judgement is made in conjunction with the competition sponsor, which in recent years has been Marks and Spencer. The winner for 2017 was Rebecca Mercedes Diaz BA (Hons) Fashion Management, a graduate from the London College of Fashion (pictured above) with Stephanie Dear - Lingerie Product Technologist from Marks & Spencer who presented the awards. Cash prizes are awarded to one winner and two runners up at the Student Conference in November each year. 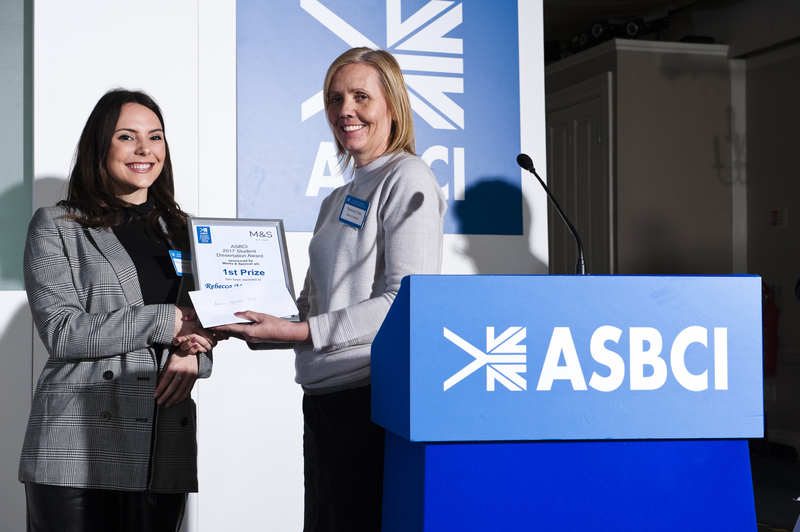 The overall winner is also asked to give a short presentation on their research topic at the ASBCI AGM held every April, and attended by the Association's corporate members. On past ocassions jobs have been offered to nominees by reading committee judges. 2016 1st Prize: Phoebe Ruscombe-King from London College of Fashion. Runners up, Natasha Nutt from Nottingham Trent University and Anna Scott from De Montfort University. 2015 Joint 1st Prize: Sarah Proud and Kerry Hogg from,Nottingham Trent University. Runners up, Nia Davies from De Montfort University and Jessica Allen from London College of Fashion. 2014 1st Prize: Sophie Nolan, London College of Fashion. Runners up: Olivia Pye, Nottingham Trent University and Yvonne Jeziorska, De Montfort University. 2013 1st Prize: Gillian Latter, De Montfort University. Runners up: Holly White, London College of Fashion and Vishika Patel, Nottingham Trent University. ASBCI - A centre of technical and commercial excellence and the UK's leading clothing supply chain association.